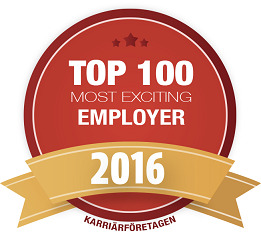 Stockholm, Sweden - Net Insight, the leading provider of live, interactive and on-demand media transport, has been appointed one of Sweden's 100 most exciting employers in 2016 by Jobtip, a Swedish company developing next generation recruitment solutions. It has been bestowed the honor of "Career Company 2016" based on the following justification: "With the vision to enable live and interactive media experiences for everyone, attracting talented professionals from around the world. Employees thrive in an inspiring, innovative and international atmosphere with opportunities for career development and specialization. Net Insight has initiated an ambitious plan to become an even more attractive employer. The company is now looking for more "passionate pioneers" to create the future of media services and was, therefore, appointed as one of Sweden's 100 Career Companies 2016." "It's a testament to our overall success and our plans for the future that Net Insight has been selected as one of Sweden's most exciting companies to work for," said Fredrik Tumegård, CEO at Net Insight. "Our journey over the last few years has given us a great platform to go on and achieve even greater success. Last year we acquired US software company ScheduALL, launched a new brand platform and entered a new market with a unique and innovative solution for live TV over the Internet, all of which has helped transform Net Insight into a more customer and market-oriented company." Net Insight is a growth company headquartered in Stockholm, Sweden. The company serves more than 500 customers and operations throughout the world, and is currently looking for several new employees to help its team lead the future of media services. Jobtip reviews and evaluates thousands of companies annually and the top 100 are chosen based on career and development opportunities, employee engagement, international reach and internal and external employer brand.